Welcome to Ocean Odyssey online. We appreciate your interest in our company and are pleased to tell the story of how we began. 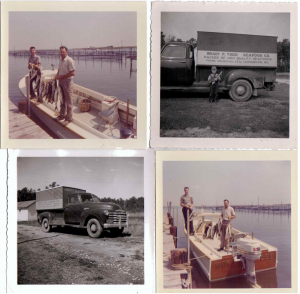 Starting in 1947 as a small crab factory located directly on the waterfront in Crocheron, Md., Bradye P Todd & Son Inc. opened its doors to produce some of the Eastern Shore’s finest Maryland Blue Crab meat and crab products. After nearly forty years at this location the decision was made to expand into other facilities and to diversify operations. Hence the creation and construction of Ocean Odyssey Seafood Restaurant and Delicatessen on Rt. 50 in Cambridge Md. 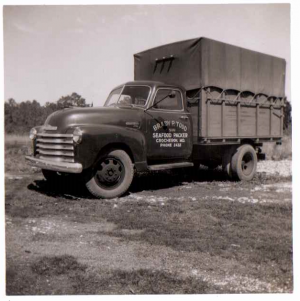 We still produce and use our own brand of crabmeat labeled as Bradye P Todd & Son which is, and has always been, a 100% domestic product ever since Poppa and Nanny started the company in 1947. We handle thousands of bushels of crabs each year. You may rest assured that each and every crab we sell has been across our culling table to provide the best quality for our customers. Our soups and crabcakes, along with many other items, are still made fresh daily in small batches to assure consistency throughout the season. sandwich shop with carry out, steamed crabs and a few dinners. Next we transitioned into a ‘sit down and enjoy yourself’ full fledged restaurant where we have tried to incorporate the best of all worlds into our cozy little dining room. What we have not changed is our commitment to use ONLY American Blue Crab Meat in all of our crab recipes. Unfortunately it is becoming more commonplace for restaurants to give in to the temptation of using cheaper imported crabmeat or crab products to improve their bottom line. So far we are holding the line in battling imported crab products. We trust you recognize the difference and appreciate our efforts on your behalf. It is our hope that you feel comfortable, full, and happy after each visit and that you will come back to see us again and again.